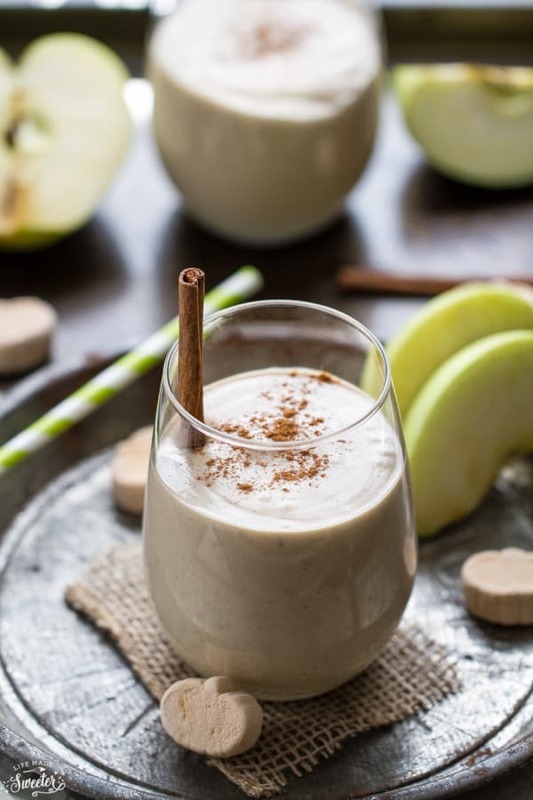 A creamy smoothie made with Pumpkin Spice Peanut Butter, bananas, apples, cozy chai spices and a handful of spinach for a delicious and filling breakfast perfect for fall mornings. 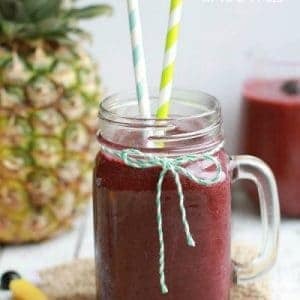 Do you guys drink smoothies all year long? I start my day with a green smoothie every morning but have to admit that once the temperatures drop, my smoothie consumption usually begins to taper. 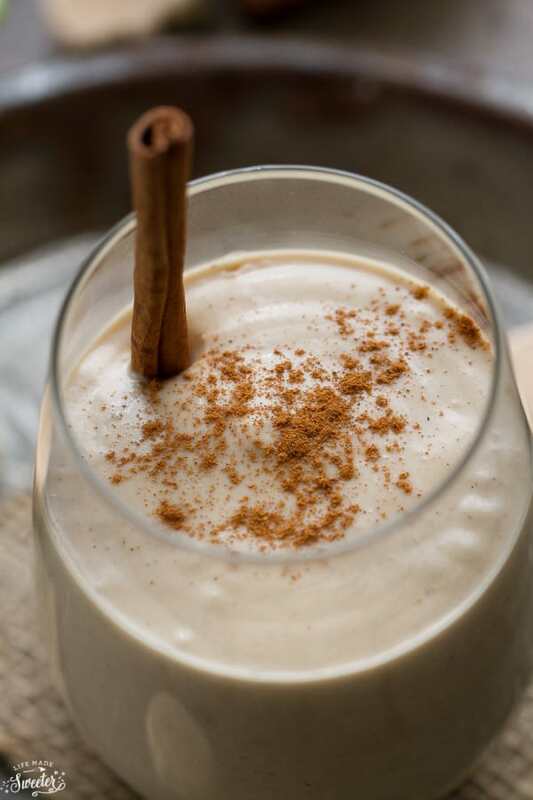 Ever since the lil guy started school, our days have kind of been more insane so to make sure our energy levels are staying up, I’ve been experimenting with adding cozy fall ingredients to help shake up my smoothie routine. 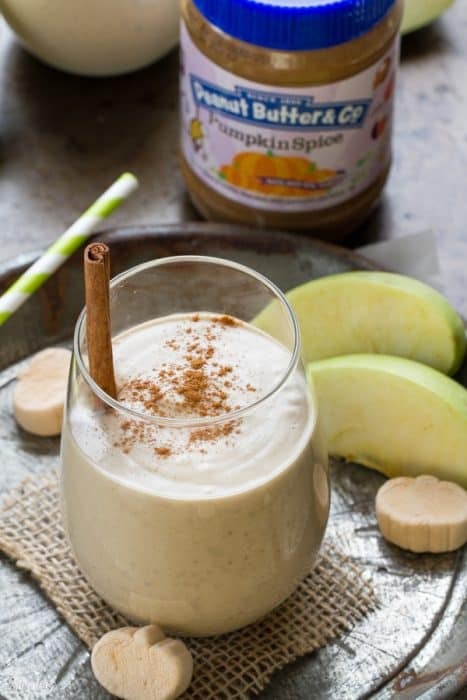 This Pumpkin Spice Peanut Butter Chai Apple Smoothie is our new favorite way to start the morning. It has all of the flavors of fall I love and tastes like you’re having dessert for breakfast. 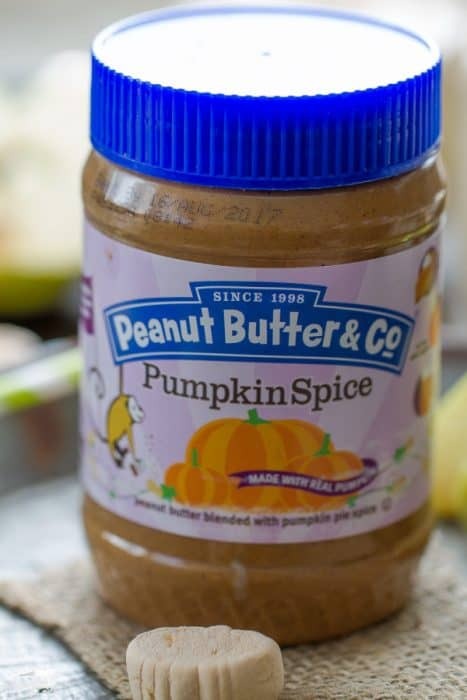 The secret ingredient is this new Pumpkin Spice Peanut Butter from Peanut Butter & Co.
It’s their first ever limited edition peanut butter blended with real pumpkin and pumpkin pie spices and it’s perfect for fall. You guys have a chance to try it out too – just scroll down for the giveaway. 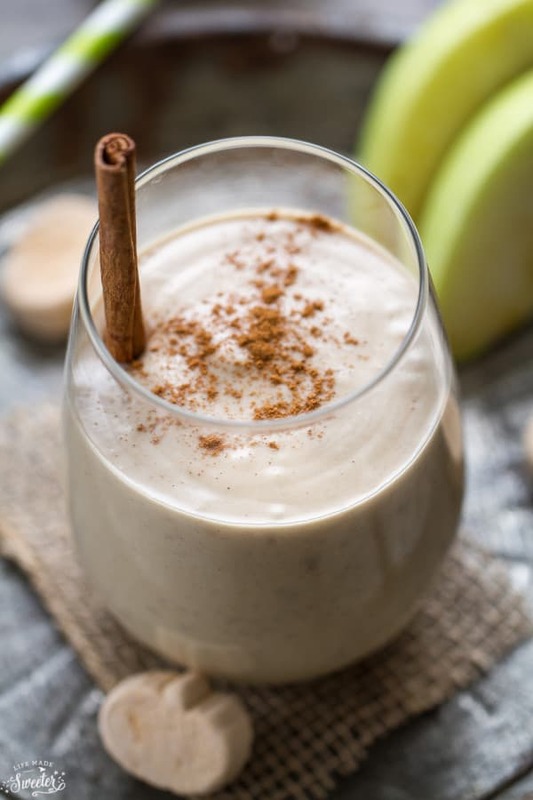 I just add a few tablespoons of the peanut butter into my blender with frozen bananas, apples, almond milk, spinach, vanilla and a blend of cinnamon, ginger, cardamom, and cloves. I didn’t add any sweetener since the bananas I used were sweet enough for me but feel free to add some honey or maple syrup if you want this sweeter. 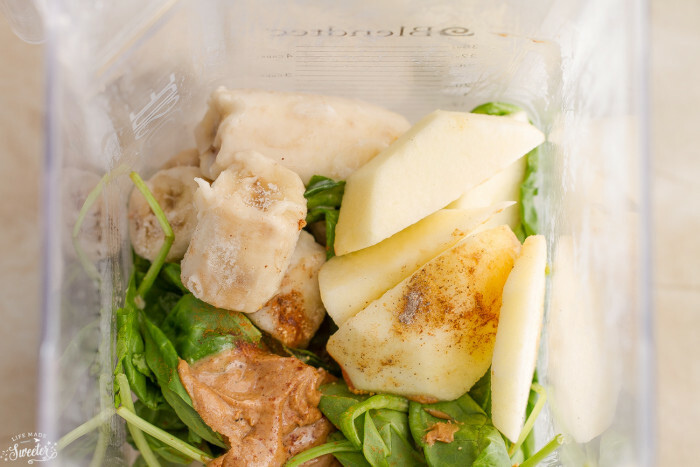 This smoothie can be made in less than 5 minutes and makes the perfect breakfast on the go. It makes just enough for me and my two small kiddos so you can certainly halve the recipe for a single serving or double it if you want a larger batch. It makes a filling breakfast or mid-morning snack and is the perfect way to refuel your energy so you can keep going all afternoon. Pour into a glass and serve immediately. Sprinkle with more cinnamon if desired. For a thicker and creamier smoothie, add 1/4 cup of Greek yogurt or 1/2 teaspoon chia seeds or reduce the amount of milk to your liking. Giveaway is open to residents within the United States only. 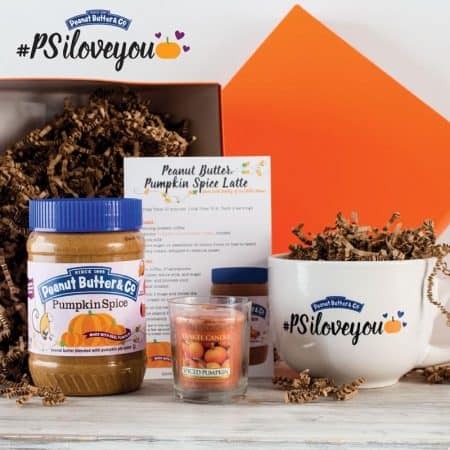 Disclosure: Peanut Butter & Co provided me with the complimentary peanut butter and are also sponsoring the giveaway. All opinions expressed here are 100% my own.